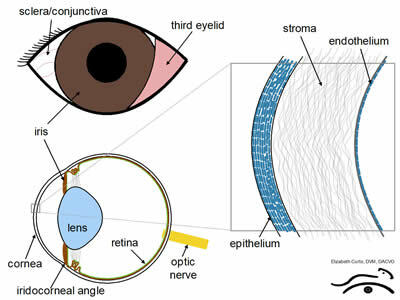 The corneal endothelium is a single cell layer that forms a barrier between the aqueous humor and the corneal stroma. The main function of the corneal endothelial cells is to control corneal hydration and nutrition. The cornea must stay dehydrated to remain clear and the endothelium is constantly working to ensure this occurs. After injury, the corneal endothelial cells have a limited capacity to divide. Some division of these cells has been documented in young dogs and cats but after a year and a half of age, the endothelium repairs itself by flattening and enlarging to cover the wounded area and maintain structure. Corneal dehydration will remain stable until 50% of the cells drop out, and therefore corneal edema results as fluid leaks into the cornea. Corneal edema imparts a blue or foggy appearance to the eye and is often mistaken for cataract or even glaucoma because the eye looks bigger. Initially, vision is not impaired but over time the owner may note vision deficits especially in dim or bright light. In the late stages almost all vision is lost although light perception and shadow vision is retained. Corneal endothelial decompensation can have many causes or etiologies. The most common are hereditary endothelial dystrophies in Boston Terriers, Boxers, Cockers, Chihuahuas, Dachshunds, Dalmatians and Poodles. Corneal edema usually starts in the outside cornea and progresses over many months to years to involve the entire cornea. Anterior uveitis, glaucoma, previous intraocular surgery or injury, and normal aging will result in endothelial cell loss. Decompensation resulting in corneal edema can occur with one etiology or a combination of these. Chronic corneal edema can be one of the most challenging diseases we treat in veterinary ophthalmology. For the animal with no clinical signs, usually no therapy is prescribed. The disease itself is not painful, but many animals will develop bullae (blisters) with resultant painful ulceration that needs to be treated. Ulceration is apparent to the owner as squinting and tearing. Secondary infection of these ulcers may occur and should be treated with topical antibiotics until healed. Hypertonic (5%) sodium chloride ointment (available over-the-counter at many drugstores) 4-5 times daily can reduce the edema by an osmotic effect, will facilitate epithelial adhesion and will help prevent bullae formation. Keratotomies and keratectomies are often employed as needed to achieve non-healing ulcers and can often be performed without general anesthesia. Corneal cautery (thermokeratoplasty) can be performed to decrease corneal edema in resistant cases. Humans suffering from this disease will have corneal transplants. 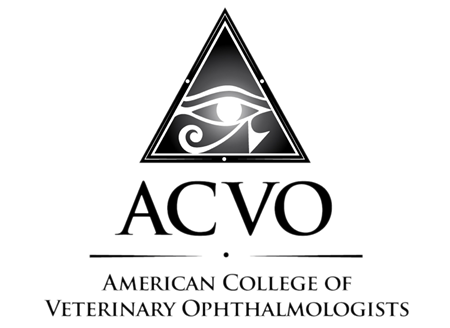 Unfortunately, corneal transplants are not yet effective in dogs, but hopefully this will change as veterinary ophthalmology evolves.